Det Ch Insp Paul Healy said: "This was a vicious and targeted attack on a man inside his car in a busy area." The force is trying to track down three male suspects, "all of slim build", who were seen leaving the area immediately after the attack at about 14:30 GMT, he added. Can Chicago's model cure London's violence? 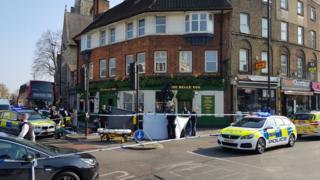 Ch Supt Simon Messinger said he understood the "alarm and concern" of local residents as the attack came just two days after a fatal shooting in the same borough.